Bitcoin is at a watershed moment. The Chicago Mercantile Exchange (CME), the largest exchange globally by notional traded, deemed Bitcoin worthy of a futures contract. The contract will allow investors to speculate on the Bitcoin/USD price without owning Bitcoin. Prior to this contract, derivatives traders were required to own Bitcoin in order to post margin on futures trading platforms such as BitMEX. Due to the different client bases that BitMEX (retail) and the CME (professional investors) serve, the price discrepancies between two futures contracts with the same underlying will present enormous opportunities to generate arbitrage profits. This guide will walk traders through how to execute such trades. Each CME contract is worth 5 Bitcoin (XBT), and is quoted in USD. Margin and profit and loss (PNL) are denominated in USD. This is what I refer to as a “linear contract structure”. Each BitMEX contract is worth 1 USD of Bitcoin, and is quoted in USD. Margin and PNL are denominated in XBT. This is what I refer to as an “inverse contract structure”. The above chart shows the XBT value of each contract. 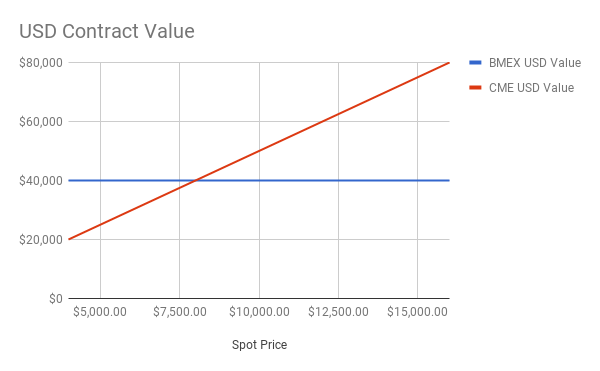 The CME contract has a fixed value in Bitcoin no matter the spot price. 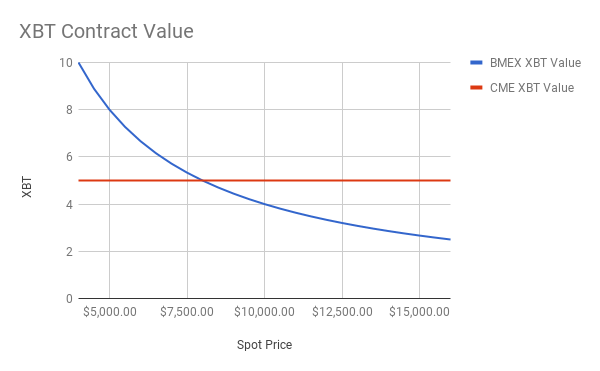 The BitMEX contract’s Bitcoin value follows a 1/x function. Technically speaking, the BitMEX multiplier is negative, even though in the graph uses a positive multiplier for a better visualisation. Assume you are long 10,000 contracts at a price of $1,000. Now the price falls to $500. At a lower price, the XBT value is a larger negative number. This means that the value in Bitcoin declines faster as the price falls, and increases slower as the price rises. That is negative gamma, or negative convexity. The above chart shows the USD value of each contract. The CME contract’s USD value changes in a linear fashion with respect to the spot price (CME contract specs). The BitMEX contract’s USD value is fixed at $1 per contract. The CME contract is much larger in notional terms than BitMEX’s. If the price of Bitcoin is $8,000, one CME contract is worth $40,000. To achieve a similar notional on BitMEX requires 40,000 contracts. When I touch on spread trades later, the much larger CME notional means that only traders with large amounts of capital can put on these trades. This limiting factor, along with the lower leverage offered by the CME, means that most retail traders will be unable to trade the CME product. The first major difference between the two contracts is the underlying index. The CME settles on the CME CF Bitcoin Reference Rate. This index includes prices from Bitstamp, GDAX, itBit, and Kraken. BitMEX settles on the BitMEX Index that includes Bitstamp and GDAX. Traders who hold either contract to expiry will need to familiarise themselves with each index, and at a minimum be able to trade on all four exchanges. Both BitMEX and the CME expire on the last Friday of the contract month. However, BitMEX expires at 12:00 UTC, while the CME expires at 16:00 London Time which is either 16:00 UTC or 15:00 UTC depending on daylight saving time. Given that the expiry time differs by only three to four hours, there is little benefit to adjust the time value when computing relative basis. Bitcoin is a call option. The more volatile it is, the more valuable the option. Due to an infinite upside, and a capped downside at zero, the trading pressure on the margin comes from longs. That means that market makers who are price neutral will usually be short derivatives. Their propensity to quote an offer depends on how easily it is to purchase spot Bitcoin and how their short derivative is margined. As I previously mentioned, the BitMEX contract is margined in XBT. That means that shorts can purchase spot Bitcoin and use this as collateral against their BitMEX short. If you buy $1,000 of Bitcoin, deposit the full XBT notional with BitMEX, then short 1,000 BitMEX contracts, you cannot be liquidated if the price rises. BitMEX shorts, due to the inverse contract structure, are long gamma in XBT terms. That means that as the price rises, their unrealised losses increase less quickly. Therefore, BitMEX shorts can use more leverage than they otherwise would if the contract used a linear contract structure. Contrast that with the CME, which margins the contract in USD. A market maker who is short cannot use their spot Bitcoin hedge as margin at the CME. As the price rises, their Bitcoin is worth more; however, those unrealised USD gains cannot be deposited as margin. The CME will demand more USD collateral as the unrealised losses mount. This makes shorting the CME contract very capital intensive. A priori, I expect the CME contract to trade more expensive than BitMEX. CME shorts need to be compensated via a higher basis for their implicit short volatility position. The CME intends to list a futures curve out to one year. The back end of the curve, due to a larger time value, will be illiquid when compared to the front months, and will trade at a very high basis. I will now present two spread trades. Assume that you are a USD-based investor. First, compute the XBT and USD exposures. Because you are a USD-based investor, you must ensure that you do not have XBT/USD risk at any time. Due to the XBT BitMEX margin requirement, you must short one additional CME contract to hedge the 5 XBT margin required on BitMEX. Due to the CME’s higher basis, we earn carry on the BitMEX XBT collateral. As predicted, we earn $50,000 PNL from this spread trade. The table below stresses the portfolio on a large up and down move. The trade continues to return $50,000 regardless of the price movement. However, this is a leveraged trade so we must post additional margin on either BitMEX or the CME, depending on the price move. The table below summarises what actions must be taken to ensure we meet margin requirements. Because we are short gamma on our long BitMEX position, we must post XBT and sell CME contracts to hedge the XBT collateral. Both of these derivatives require additional margin. On the upside, we only need to post additional USD with the CME. Depending on your cost of capital, a prolonged down move without any recovery could become very expensive. Another issue is the sizing of this trade. Each CME contract is worth 5 XBT. If you wish to remain price neutral on your XBT collateral, a 5 XBT loss needs to be a small % with respect to your trade notional. Otherwise you will always be over and under hedged. The below table illustrates this point. The “% Move” is a measure of how far the price needs to move up or down to generate a contract value change of 5 XBT. As you can see, go big or go home. In order to hedge the 5 XBT of margin required, sell an additional 50,000 BitMEX contracts. As predicted, we earn $50,000 PNL from this spread trade. The below table stresses the portfolio on a large up and down move. The trade continues to return $50,000 regardless of the price movement. However, this is a leveraged trade so we must post additional margin on either BitMEX or the CME depending on the price move. Because you have positive gamma on the short BitMEX position, you will not face a doubling of margin requirements when the price falls. This spread trade is more capital efficient; however, I doubt whether BitMEX will frequently trade more expensive than the CME for reasons described above. The CME does not trade over the weekend. Longs or shorts depending on the price action over the weekend, could be insta-rekt when the exchange reopens Sunday night US time. Interactive Brokers, one of the CME’s clearing members, expressed severe reservations about this product due to the high volatility. They are scared shitless about how to deal with underwater shorts. It is not impossible for Bitcoin to gap up 100% in a matter of hours on positive news. Imagine what will happen when an ETF finally is approved. BitMEX deals with gap risk via auto-deleveraging. The CME at the present moment cannot employ a socialised loss feature. Instead, clearing members must pony up the cash. That is why they are being such scaredy cats. Depending on your broker, margin requirements for short positions could be extremely unforgiving. This will push CME basis up even further, and make putting on the spread trade, described above, even more expensive. Arbitraging BitMEX versus the CME requires a high level of trading sophistication and attention to detail. The different margin currencies and policies present many opportunities to transform what is a sure profit into a massive loss. However, owing to their difficulty, these spread trades will be juicy. For students of markets, this is an arbitrage opportunity of a lifetime. Those who put in the time to perfect these strategies will profit handsomely.